A man lies dead on the platform of Reality on the Norm's train station. As PC Leon Evans, you'll have to discover the motive, the murder weapon and track down the murderer. "This short but satisfying Reality-on-the-Norm adventure stars a new character investigating a murder." hey, good job, how do I post a picture? This is a good first effort for a game. 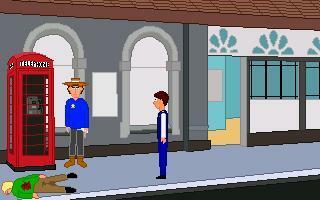 The graphics are pretty plain, but the adventure mechanics are generally solid. If you have a spare bit of time I'd download it and give it a run. A classical crime story with doing typical police work and finding evidence. The PC was very likable and I enjoyed the final logical dialog puzzle. You better have paper and pencil next to your computer when playing to make notes.